There was limited information about the efficacy of myeloablative allogeneic peripheral blood stem cell transplantation (allo-PBSCT) in non-complete remission (non-CR) patients with relapsed/refractory peripheral T cell lymphomas (PTCLs). We conducted a retrospective study of 21 consecutive non-CR patients with relapsed/refractory PTCLs who received myeloablative allo-PBSCT between January 2008 and June 2016. The median follow-up of survivors was 46.5 months (range, 14–105 months). The estimated 3-year relapse rate was 24% (95% CI, 9 to 43%). The 3-year non-relapsed mortality rate was 24% (95% CI, 9 to 44%). Overall, the estimated 3-year overall survival was 47% (95% CI, 25 to 66%). And the estimated 3-year progression-free survival was 46% (95% CI, 24 to 66%). Specifically, eight patients failed to achieve a CR at the first evaluation 3 months after allo-PBSCT and received withdraw of immunosuppression. Five patients also received donor lymphocytes infusions. Five (5/8, 62.5%) patients responded subsequently to these interventions (complete = 4, partial = 1). Overall, ten patients were alive at our last follow-ups, and durable CR were achieved in nine patients without further therapy. Five (50%) of these ten alive patients experienced chronic graft-versus-host disease (GVHD). Our favorable clinical outcomes suggested myeloablative allo-PBSCT was a valid therapeutic option for non-CR patients with relapsed/refractory PTCLs. 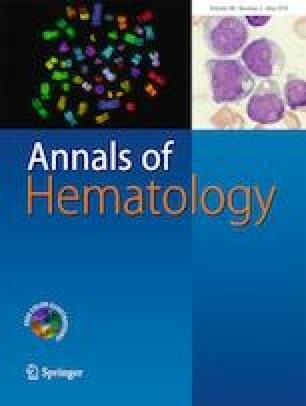 The sustained CR after immunotherapeutic intervention and high prevalence of chronic GVHD in alive patients provided evidence of graft versus T cell lymphoma effects. Zhenyang Gu and Lu Wang contributed equally to this work. Chunji Gao, Daihong Liu, Wenrong Huang designed the study and initiated this work; Data was obtained by Zhenyang Gu, Lu Wang, Quanshun Wang, Honghua Li, Jian Bo, Shuhong Wang, Yu Zhao, Fei Li, Chunji Gao, Daihong Liu, Wenrong Huang. Monitoring and all statistical analyses were performed by Zhenyang Gu, Lu Wang, Chunji Gao, Daihong Liu, Wenrong Huang. Zhenyang Gu wrote the paper; all the authors were involved in the interpretation of the results; read, gave comments, and approved the final version of the manuscript; had full access to the data in the study; and take responsibility for the accuracy of the data analysis. All authors did not have any grants for this manuscript. All authors declared that they had no conflict of interest. All procedures performed in studies involving human participants were in accordance with the ethical standards of the institutional and/or national research committee and with the 1964 Helsinki declaration and its later amendments or comparable ethical standards. The Medical Ethics Committee of PLA General Hospital reviewed and approved this study. All authors agree that this manuscript can be published in Journal of Experimental & Clinical Cancer Research. All data and material are available in this manuscript.